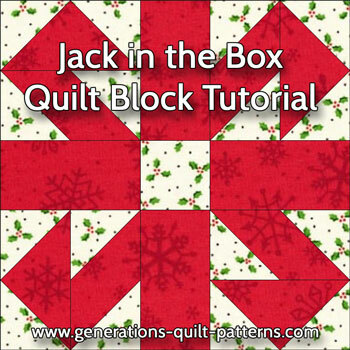 The Jack in the Box quilt block is simple to make using either the Connector Corners technique or paper piecing for perfect pointy points. You'll find both techniques available on this page in three different sizes. As always, if you choose to paper piece, the pattern downloads are free and located on this page, too! This block is also called Wheel of Fortune and Whirligig. 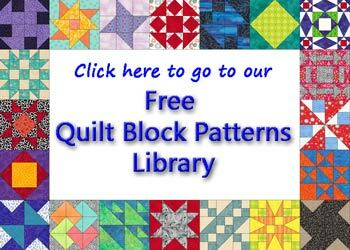 Regardless of the technique you choose, try our favorite method for getting flatter blocks. Click here to learn about this simple and effective pressing technique. 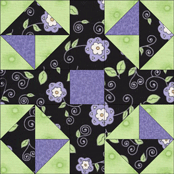 The blue chart is for paper pieced Jack in the Box quilt blocks. After deciding on the size, you can download the necessary patterns right from the chart—third line up from the bottom. 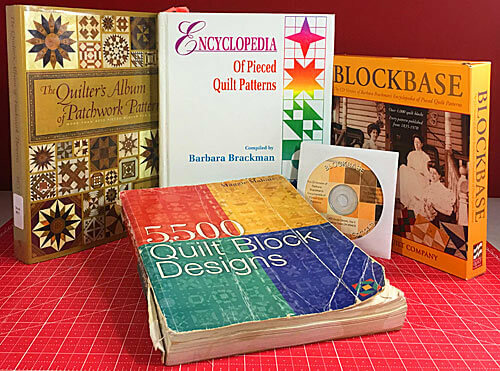 You'll need the most current version of Adobe installed on your computer to download the paperpiecing pattern. 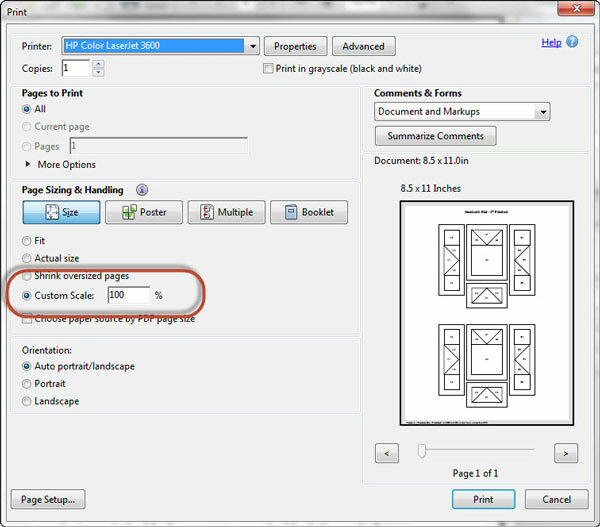 On the Adobe Print Menu page, under 'Page Size and Handling' set 'Custom Scale' to 100% before printing for accurate results. Click here to see what it looks like on the Print Menu page. 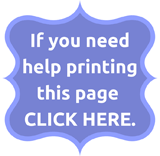 There is a 1" square on the page to help you confirm it is printed correctly. Note, too, that the 'Patch #'s' are sometimes words. This is to make it easier to keep track of the units between both methods. The pink chart is for the Connector Corners technique. Choose your method and cut from the appropriate chart. 5 A 4 1½" x 2½" 2” x 3½" 2½" x 4½"
Center B 1 1½" x 1½" 2” x 2” 2½" x 2½"
Unfinished unit measures...	 2½" x 2½" 3½" x 3½" 4½" x 4½"
block measures... 5½" x 5½" 8” x 8” 10½" x 10½"
**Print two copies for a total of 4 units. 1, Goose A 8 1½" x 2½" 2” x 3½" 2½" x 4½"
2, Sky B 16 1½" x 1½"	 2” x 2” 2½" x 2½"
Center	 B 1 1½" x 1½" 2” x 2” 2½" x 2½"
Unfinished unit measures... 2½" x 2½" 3½" x 3½" 4½" x 4½"
Box quilt block measures... 5½" x 5½" 8” x 8” 10½" x 10½"
Click here for detailed instructions using connector corners to make the units. When you are finished, click the 'Back' button on your browser bar to return here. Cut the four patterns from the downloaded page(s) just outside the dotted lines. 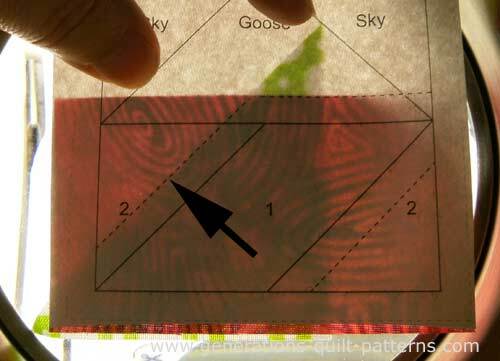 With a dab of Elmer's Glue Stick, the one that goes on purple and dries clear, stick the back side of #1 to the unprinted side of the pattern. Use the dashed placement lines to position it. This patch should extend approximately an 1/8" past the outside edges of the unfinished block. With RST add a #2. It doesn't matter which side is first. Just be consistent. That way if you've making a boatload of these blocks, you can get a rhythm going. 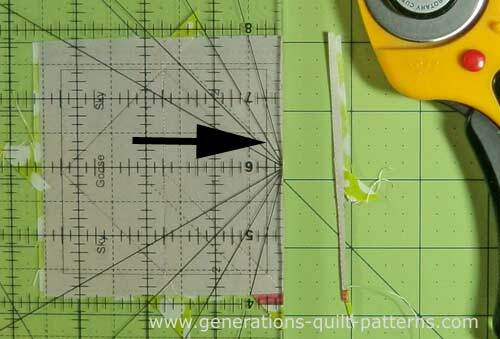 You should be able to see through the pattern to use the dashed placement line. Add the second #2 and press. 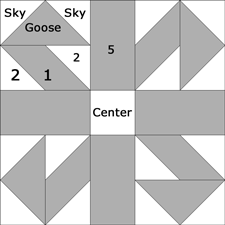 Add a 'goose' triangle. Use the placement line to help you position it. Stitch, starting and stopping past the edge of the unfinished block. Trim to a quarter inch seam. 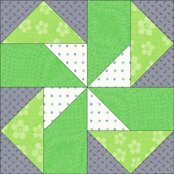 In the photo below, just the excess green dot fabric will be trimmed away. Add the sky triangles one at a time, pressing and then trimming away any excess after each is added. To trim, align the 1/4" mark of your ruler with the solid outline of the block. Trim with your rotary cutter. Repeat for all sides. Repeat to make the three remaining units. Lay out the Jack in the Box units and cut patches into rows like this. 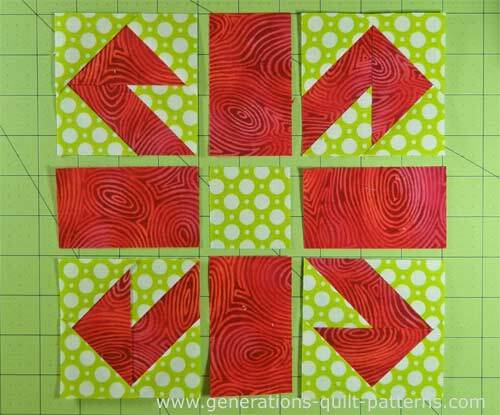 Pay careful attention to rotate the pieced units a quarter turn clockwise as you move around the block. 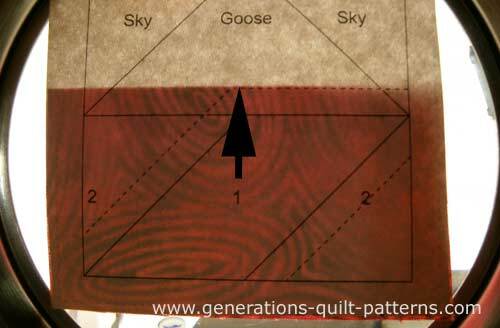 The geese point out from the center. 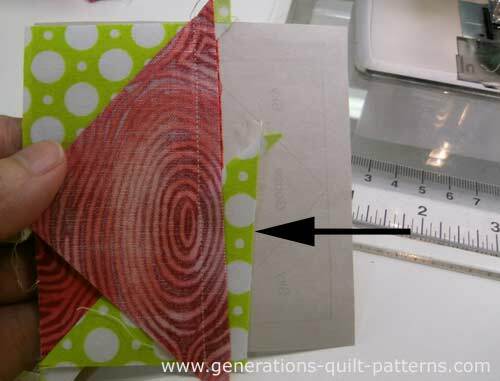 With a 1/4" seam allowance, stitch the patches into rows. Press with SAs in the direction of the arrows, away from the pieced Jack in the Box units. 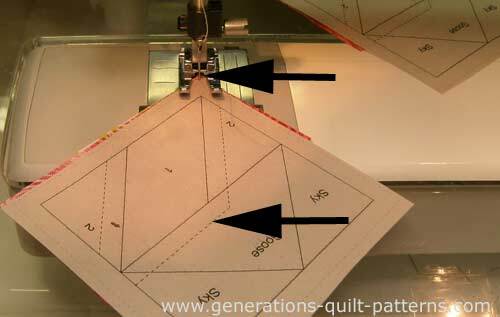 Sew the rows together with a 1/4" seam. 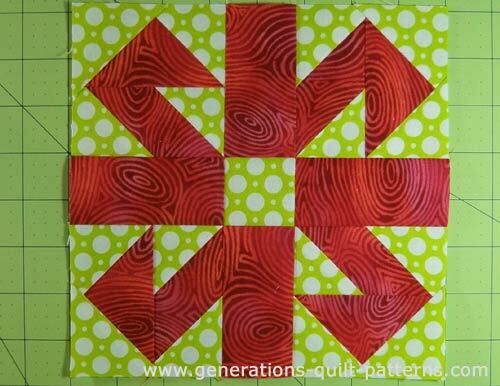 After one final press, your finished Jack in the Box quilt block looks like this! 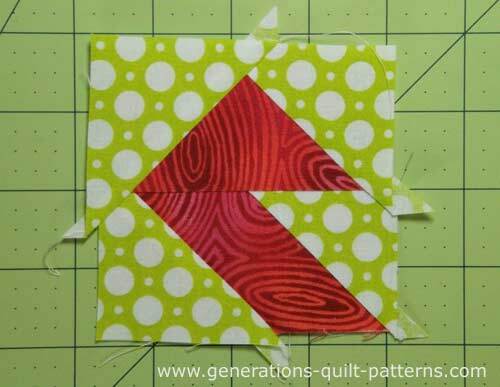 Maybe it's because I'm making this at Christmastime, but this block really reminds me of a bow? You, too? There are a few variations on the basic design. 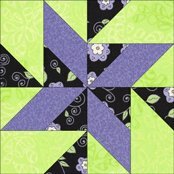 The one thing that doesn't change is the strong movement created by the central pinwheel motif. In this first variation, the unit is the same, but the cut square and rectangles are removed. 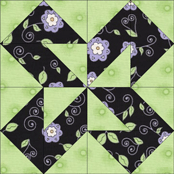 Click here for instructions to make a Colorado Beauty block. The rectangle has lost a HST. 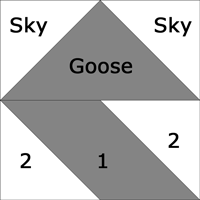 The pieced rectangle is flipped end to end and the goose has lost one of it's sky patches. Two HSTs are substituted in for the goose! 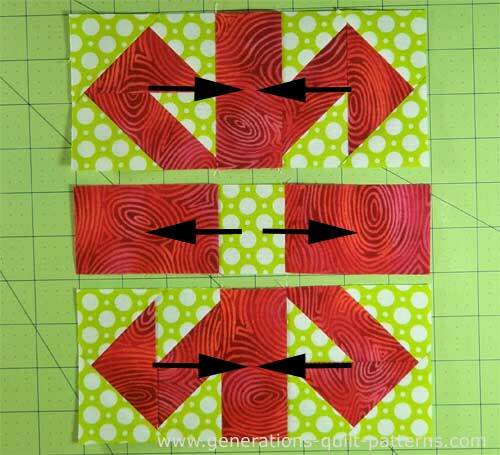 This version of the Jack in the Box quilt block is closely related to ours—the only difference being the HSTs that have replaced the pieced rectangles.